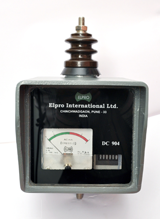 Elpro’s Surge Counter will automatically recordthe number of lightning and switching surge discharges of Station class surge arresters on a five digit cyclometer dial. Impulse discharges through the arrester must also pass through the surge counter as it is insulated from, and mounted at the base of the arrester, and connected between the arrester ground terminal and the station ground. The counter will register impulse discharges through the arrester of an amplitude of 40 amperes or greater. The counter is capable of up to five registrations per second and operates without any external power source. The counter has negligible effect on the overall protection afforded by the surge arrester, since the potential across the counter is only 5000 volts during a discharge (and less than 200 volts under normal operating conditions). The surge counter also has acontinuous A.C Leakage Current indicator. The indicating ammeter has a 0-5 mA crest scale visible through the glass housing. The leakage current observed, is the sum of any leakage current across the External ( porcelain) insulation plus the internal current flowing through the internal Zinc Oxide Disc stack. Presence of airborne external contaminants on the porcelain housing will increase the level of current registered and serves as a guide for the frequency of cleaning of the station arresters in the field. Simple operation of the Surge Counter means a dependable performance and long life. Arrester discharge current passes through a shunt arrangement to charge a capacitor; discharge of this capacitor through a solenoid operates the cyclometer count. The leakage current ammeter is connected in parallel with the main discharge path and calibrated to measure the crest value of the combined leakage and internal currents. Copyright © 2016 Elpro. All rights reserved.